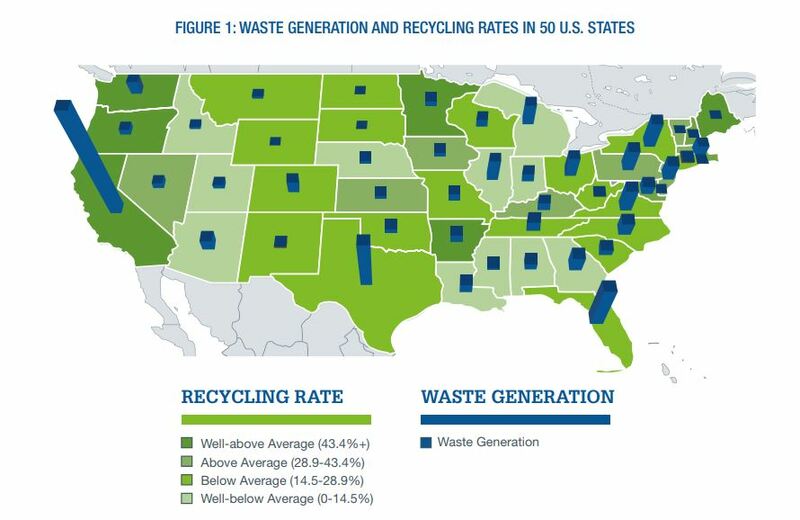 The case study outlines a blueprint for improving the U.S. recycling rate. The U.S. Chamber of Commerce Foundation (USCCF) and its partners announced the release of the “Beyond 34 Case Study: The Development of a Recycling Public-Private Partnership,” which is part of the U.S. Chamber Foundation’s multi-stakeholder pilot project called Beyond 34: Recycling and Recovery for A New Economy. It evaluates efforts undertaken in the project’s pilot city, Orlando, Fla. The project aims to increase the current 34 percent recycling rate in the United States by providing a scalable model for improving recycling and recovery rates. The goal of the project is to help communities, cities and businesses across the country create a more sustainable future. Beyond 34 was established in September 2017, when Orlando was selected as the pilot city location to launch the program. Since then, the U.S. Chamber Foundation has convened business leaders, recycling planners and key stakeholders in Orlando and the surrounding municipalities to collaborate around a sustainable system that would positively impact the local area’s recycling rate. The primary goals of Beyond 34 include demonstrating a scalable process for improving recycling and recovery infrastructure through increased recycling systems efficiency in a selected U.S. city-region; providing a blueprint demonstrating how to optimize recovery of high-value materials from the waste stream through private-public partnerships and adoption of best practices; developing strategic partnerships through the value chain and with state and local chambers of commerce to collectively accelerate the U.S. toward a market-driven approach to a circular economy for the benefit of the communities, environment and economy; and raising awareness of the barriers and opportunities for transitioning to a circular economy in the U.S. and leveraging pilot learnings to address closed loop challenges for materials recovery. 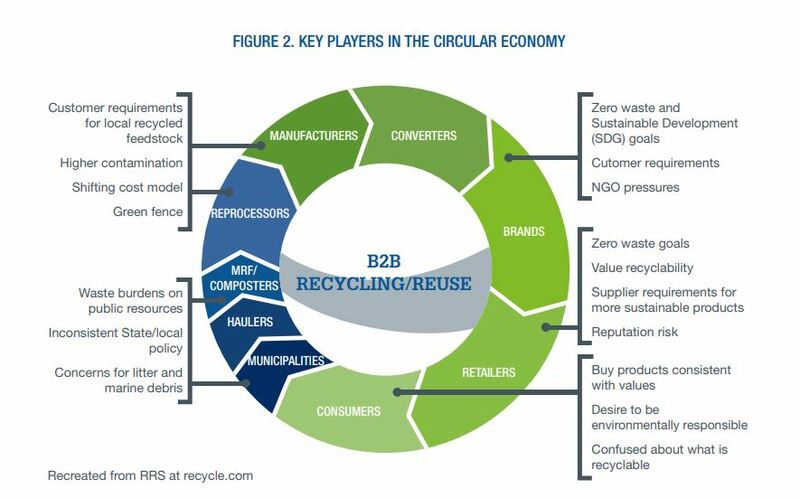 The Beyond 34 case study serves as a guide for other communities seeking to strengthen their economic competitiveness through recycling initiatives. The case study illustrates how the investment is making an impact, fostering ideas for how to address the recycling and recovery gap and providing insights on how to replicate such a project. The Beyond 34 project is a private-public partnership between the U.S. Chamber Foundation, RRS, the Orlando Regional Chamber of Commerce and the City of Orlando. The U.S. Chamber Foundation is working with leading brands, manufacturers, retailers, industrial service providers and other partners to tackle the recycling and recovery gap in the U.S. and accelerate recycling infrastructure development. 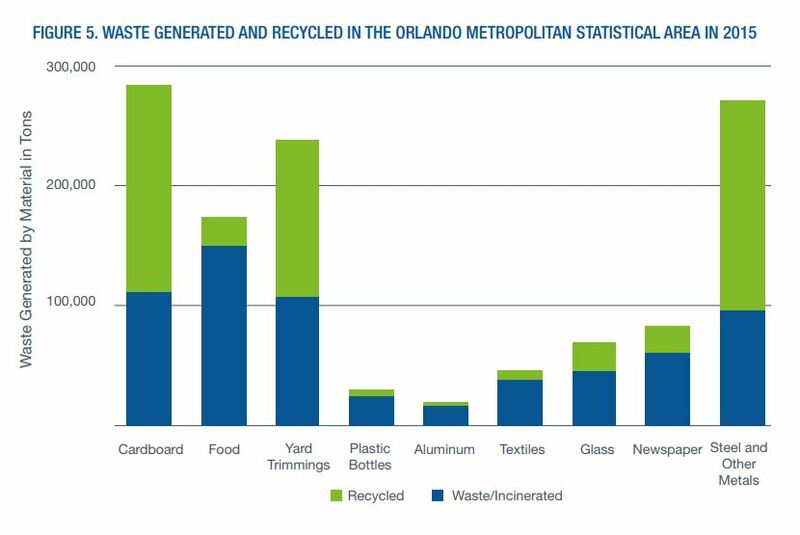 RRS facilitated the development of a recycling gap analysis for the Orlando region and its local stakeholders that keeps high-value recyclable material out of landfills. The gap analysis determined that more than $62 million of currently disposed materials could be of commercial value if they were recycled. Based on the gap analysis findings, RRS recommends organizing a recycling champions’ network, developing a regional plan for recycling, leveraging technology to recover more commodity recyclables, expanding a backyard composting and food waste drop-off network, developing supportive waste policies and initiatives and engaging public and private stakeholders through a collaborative communications campaign. Going forward, stakeholders will consider the recommendations that RRS identified and projects that the founding Beyond 34 entities (aka Project Founders) propose. Only 70 percent of the U.S. waste stream can be recycled or composted. Recycling system best practices include collection, processing, end markets, education, policy and partnerships. In 2014, the U.S. generated 258 million tons of residential and commercial waste, and only 34 percent of that municipal solid waste (MSW) was recycled or composted. State recycling rates range from 4 percent in Oklahoma to 53 percent in California, with 33 states and the District of Columbia having recycling rates below the national average. USCCF and Trucost, an environmental research firm, found that 5,589 of the largest publicly-traded companies in the U.S. sent 342 million metric tons of waste to landfills and incinerators in 2014. Shifting to a circular economy could unlock an estimated $4.5 trillion in additional economic growth by 2030, marking the biggest economic revolution in 250 years. Pilot programs are an essential component of transitioning to a circular economy because they showcase the value of a circular economy and test best practices in a collaborative environment. Additionally, public-private initiatives can provide funding mechanisms for recycling infrastructure development. The average recycling rate at the state level is 37 percent, according to the Florida Department for Environmental Protection. The regional recycling rate is 42 percent, 5 percent higher than the state average. Strong public and private sector engagement, an innovative culture and robust sustainability goals contributed to the Orlando area’s selection as the Beyond 34 pilot region. In Florida, the recycling rates for newspaper, glass, aluminum cans and plastic bottles are lower than national, state and regional recycling rates. Textiles, food and other plastic waste also have recycling rates below the average regional recycling rate. Common strengths in the Orlando recycling community include curbside collection with rolling carts, weekly collection, some recycling education and recycling services embedded in disposal charges. Common opportunities in the Orlando recycling community include commercial and multifamily provision, food scrap collection, processing options, financing options, partnership funding opportunities and partnership programs. The total cost of lost recyclables in the Southeast has an estimated market value of $721 million and a disposal cost of $220 million. In mid to late 2018, USCCF will replicate the Beyond 34 model in another region with the lessons learned from the Orlando region. The ultimate goal is to have the U.S. move beyond its current 34 percent recycling rate once enough regions have embraced the Beyond 34 model.